The NGINX Plus configuration file distributed with the reference implementation, nginx-ldap-auth.conf, configures all components other than the LDAP server (that is, NGINX Plus, the client, the ldap‑auth daemon, and the backend daemon) to run on the same host, which is adequate for testing purposes. The LDAP server can also run on that host during testing. 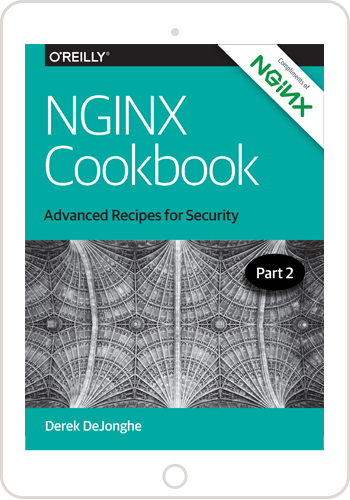 In an actual deployment, the backend application and authentication server typically each run on a separate host, with NGINX Plus on a third host. 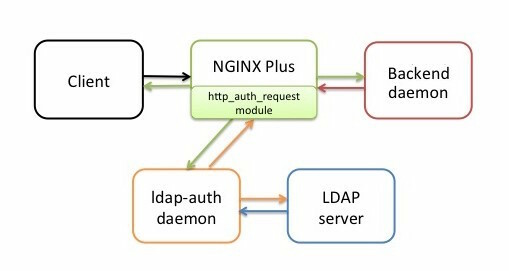 The ldap-auth daemon does not consume many resources in most situations, so it can run on the NGINX Plus host or another host of your choice. Create a clone of the GitHub repository. If NGINX Plus is not already running, install it according to the instructions for your operating system. If an LDAP server is not already running, install and configure one. By default the ldap‑auth daemon communicates with OpenLDAP, but Microsoft Windows Active Directory 2003 and 2012 are also supported. If you are using the LDAP server only to test the reference implementation, you can use the OpenLDAP server Docker image that is available on GitHub, or you can set up a server using instructions such as How To Install and Configure OpenLDAP and phpLDAPadmin on Ubuntu 16.04. Make note of the values you set for the Base DN, Bind DN, and Bind password. You will put them in the NGINX configuration file in Configuring the Reference Implementation. On the host where the ldap‑auth daemon is to run, install the following additional software. We recommend using the versions that are distributed with the operating system, instead of downloading the software from an open source repository. Python version 2. Version 3 is not supported. The Python LDAP module, python‑ldap (created by the python-ldap.org open source project). nginx-ldap-auth.conf – NGINX Plus configuration file that includes the minimal set of directives for testing the reference implementation. Install on the NGINX Plus host (in the /etc/nginx/conf.d directory if using the conventional configuration scheme). To avoid configuration conflicts, remember to move or rename any default configuration files installed with NGINX Plus. nginx-ldap-auth-daemon.py – Python code for the ldap‑auth daemon. Install on the host of your choice. nginx-ldap-auth-daemon-ctl.sh – Sample shell script for starting and stopping the daemon. Install on the same host as the ldap‑auth daemon. backend-sample-app.py – Python code for the daemon that during testing stands in for a backend application server. Install on the host of your choice. Modify the NGINX Plus configuration file as described in Configuring the Reference Implementation below. After making your changes, run the nginx -t command to verify that the file is syntactically valid. Run the following commands on the appropriate hosts to start the ldap‑auth daemon and the backend daemon. 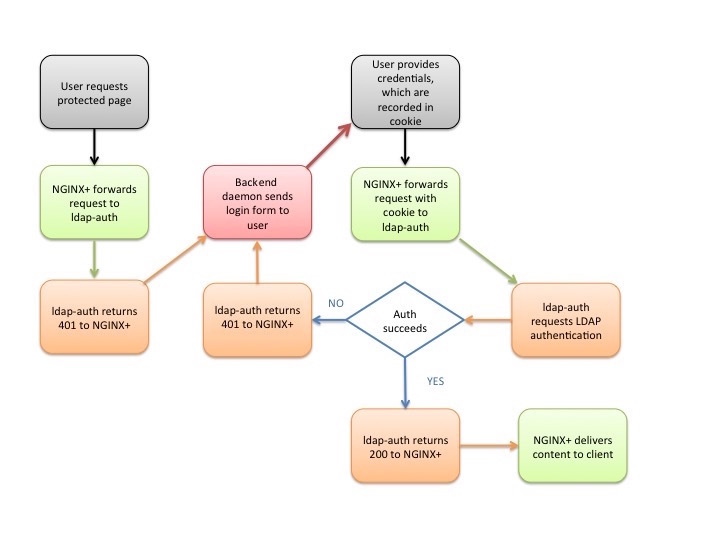 Make the following changes in the nginx-ldap-auth.conf file. Some are required and some optional, as indicated. As implemented in nginx-ldap-auth-daemon.py, the ldap‑auth daemon communicates with an OpenLDAP server, passing in parameters to specify which user account to authenticate. To eliminate the need to modify the Python code, the nginx-ldap-auth.conf file contains proxy_set_header directives that set values in the HTTP header that are then used to set the parameters. The following table maps the parameters and headers. (Required) In the following directives, replace the values in bold with the correct values for your LDAP server deployment. Note in particular that the nginx-ldap-auth.conf file uses the well‑known port for LDAPS, 636. If you change the port to 389 (the well‑known port for LDAP) or another LDAP port, remember also to change the protocol name from ldaps to ldap. The proxy_cache_path directive in the http configuration block creates a local disk directory called cache, and allocates 10 MB in shared memory for a zone called auth_cache, where metadata is stored. If you change the name of the shared memory zone, you must also change it in the proxy_cache directive (in the location block that directs traffic to the ldap‑auth daemon). The proxy_cache_valid directive (in the same location block as proxy_cache) specifies that cached responses marked with HTTP code 200 or 403 are valid for 10 minutes. To disable caching, comment out these three directives plus the proxy_cache_key directive. As mentioned above, you can use the ldap‑auth daemon as a model for your own application that accepts requests from the http_auth_request module. If writing an app in Python to communicate with a different (non‑LDAP) type of authentication server, write a new authentication‑handler class to replace LDAPAuthHandler in the nginx-ldap-auth-daemon.py script. The backend daemon uses Base64 encoding on the username and password in the cookie. Base64 is a very weak form of scrambling, rendering the credentials vulnerable to extraction and misuse. For authentication to serve any real purpose, you need to use more sophisticated encryption in your backend application.